Perfectly situated in the southwest part of Rwanda, Nyungwe Forest National Park is a vast unexplored tropical rainforest with a high, dense canopy. Nyungwe National Park is one of the parks that were created of recent in 2004.The Park was established to increase on tourists’ attractions and activities in addition to mountain gorillas which attract many gorilla safaris to Rwanda. Due to the park’s spectacular eco-system, Nyungwe national park deserves its status and visit by any traveler planning safari to Rwanda. Spanning over 1,020km² of land, Nyungwe national park is natural home to about 310 different bird species and hence making the park to be safe birding destination for bird lovers on Rwanda Safaris and tours. In addition to the birds, the part harbors hundreds of butterflies and orchids and all these can be confronted by traveler who decides to under safari to Rwanda’s destination of Nyungwe national park. Nyungwe Forest is one of the loviest forests left in Africa and it’s characterized with tall old mahoganies, giant tree ferns, ebonies as well as orchids, epiphytes. The existence of these unique flora species makes the park the best place were travelers on Rwanda safaris can enjoy activities such as tree species identification, bird watching since the forest is decorated with different bird species. Nyungwe national park is an ideal tourism destination for travelers on primate safari to Rwanda .The park boast of an estimated number of 13 different species of primates. This includes even the world’s threaten species of the chimpanzees. This has enabled the park to become the only sole destination in Rwanda where one can trek the chimpanzees. Chimp trekking in the park starts as early as 8:00am local time and as it’s with mountain gorilla trekking, one habituated chimpanzee troop is only open to group of eight individuals. Nyungwe national park is the only park in the whole of east Africa where travelers on Rwanda safaris can enjoy canopy walk .The interesting walk enables you to enjoy the views and sights of different Wildlife and bird-life housed in tropical rain forests of Nyungwe. Forest hiking is one of the most interesting activities one should opt for while on Rwanda safaris to Nyungwe National Park. The forest hiking trails developed in the park allows tourists on Rwanda tours and safaris to explore the interior of the ever green forest. 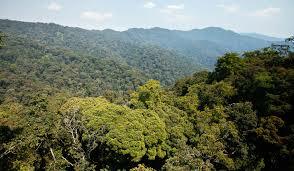 Walking in the forest of Nyungwe offers excellent way of enjoying the sights and views of different birds.